Thomas Dudley's maternal grandmother, Mary Purefoy, was the daughter of Edward Purefoy and his wife Anne Fettiplace. Anne was born on 13 June 1494 and died in 1558. She was the daughter of Richard and Elizabeth Beselles Fettiplace of Shelford, Berkshire. Anne had sisters, Mary, Eleanor, Dorothy, Elizabeth and Susan. There were also brothers, but my concern here is with the females of the family. The Fettiplace family was of great antiquity and was very wealthy. Education was important for not only the males of the family, but, unusually, for the females as well. Richard Fettiplace, the girl's father, died in late 1510 or early 1511 leaving a will that made bequests for two daughters marriage portions; Dorothy and Eleanor. Presumably the others were already married at the time of their father's death, or other arrangement had already been made. 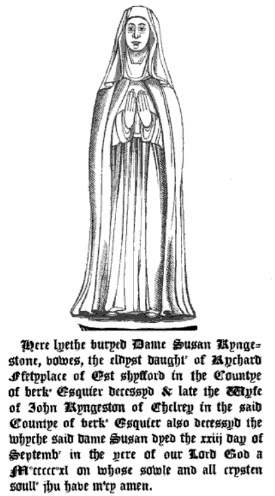 Mary Fettiplace married James Yate (d. 1543) of Buckand, Berkshire and had daughter Elizabeth. 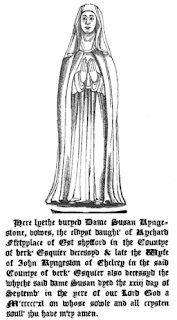 Susan married John Kyngston of Childrey (d. 1514), Berkshire and Thruxton Hampshire. He died very early in their childless marriage at the age of 23. Dorothy married a man named John Coddrington or possibly Goddrington. Their marriage contract was made in Oct. 1517 and stipulated that they should marry by 13 May 1518. John was dead on 31 December 1518. Another Fettiplace daughter widowed young with no children. After the death of her husband, Susan took an uncommon route for her life, she became a 'Vowess', at the Abbey of Syon. Syon was a, if I may call it such, a co-ed religious establishment that housed both a monastery for men but also an abbey for women. The monks and nuns were of the Brigittine Order. Education and reading were especially important to the abbey. A vowess was a woman who had been married, but was not a full nun. She could come and go as she pleased. The Vowess paid the Abbey for her room and board and could keep servants. Susan was joined at Syon by her grandmother Alice Besselles in 1520. Susan's mother Elizabeth Besselles Fettiplace Elyot was also believed to have become a vowess at Syon after the death of her second husband. The maternal grandmother of the Fettiplace girls, Alice Harcourt was living at Syon as a vowess at her death in 1526. When Dorothy's husband died and left her a childless widow, she choose to take her vows one step further and became a nun at Syon. The sister's were joined by Eleanor, who never married, and became a nun at Syon some time around 1520. Mary Fettiplace Yates' daughter Elizabeth Yate also took her full vows and became a nun as did her cousin Susan Purefoy. The only sister who did not have ties to Syon was Elizabeth, who was a nun in Amesbury. The heir of Richard and Alice Besselles was their daughter Elizabeth Fettiplace, the girl's mother. After the death of her husband Richard in 1510 she remarried to Sir Richard Elyot, the father of Sir Thomas Elyot. Sir Richard was a jurist and had been the King's Sergeant at Law for both King Henry VII and his son King Henry VIII. The 1530's was a time of religious upheaval. Henry VIII, in his desire to marry Anne Bolyen was beginning his break with the Pope in Rome and on his way to establishing a protestant church with himself at it's head. In 1534 Sir Thomas More was imprisoned by Henry for refusing to take an oath recognizing Henry as the head of the English church. Some time that year, after, July, Sir Thomas Elyot published a translation of the sermon of St. Cyprian. He dedicated it to his step-sister Ellen and mentioned her sister at Syon. The sermon may have been meant as an encouragement to Catholics in England during those trying times. At that time all the religious houses were put under pressure to recognize Anne Bolyen as Henry's true wife. Syon acquiesced and signed. However, one of the monks, Richard Reynolds, refused. He was imprisoned and was, according to the catholic church, martyred, at Tyburn on 4 May 1535. His death was especially brutal. After being dragged through the streets of London, he was drawn and quartered. His body parts were displayed in various parts of London. Today, he is a catholic saint. On 25 November 1539 the community was expelled from Syon. Susan Kynston may have already left, she was living with her sister Mary Purefoy at the time of her death on 23 September 1540. Many of the nuns and the Fettiplace vowess' were sheltered at Buckland, the home of the Yates.The Abbey was briefly restored in 1557 during the reign of catholic Queen Mary. Sir Frances Englefield, husband of Catherine Fettiplace, undertook it's restoration. 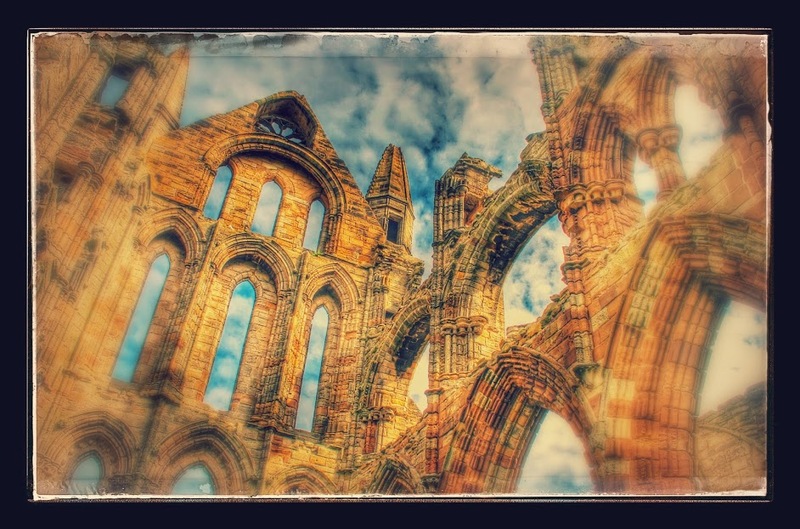 With the succession of protestant Queen Elizabeth the abbey was shuttered for good. After the closure of Syon Abbey, the nuns and vowess' were once again dispersed. Eleanor went to Zurich were she died in 1565. Dorothy lived a long life, dying in her eighties in 1586. When she died, her great nephew Thomas Dudley was ten. He would grow up to become the Governor of the Puritan Colony of Massachusetts. I wonder what they would have thought of each other. Mary C. Erler, Women, Reading and Piety in Late Medieval England, (New York: Cambridge University Press, 2006). Kathy Lynn Emerson, "Susan Fettiplace," A Who's Who of Tudor Women: F, (http://www.kateemersonhistoricals.com/TudorWomenF.htm : accessed 22 May 2016).